Stockton gets a lot of bad press for rankings: Forbes miserable city “index”, FBI crime rankings, foreclosure lists, etc. Some of this publicity is valid, Stockton can’t hide the face that there is a high crime rate and foreclosures continue to hamstring the city, while others (I’m, looking at you, Forbes) don’t rely on actual data. However, to really understand the state of the city, it helps to look at hard research and analysis that incorporates data and trends from various sources, rather than looking at one survey or one data set to draw entire conclusions about a community. Gallup, known mostly for the political polling services, has a fairly complex tool that attempts to measure the well-being of metro areas across the country. 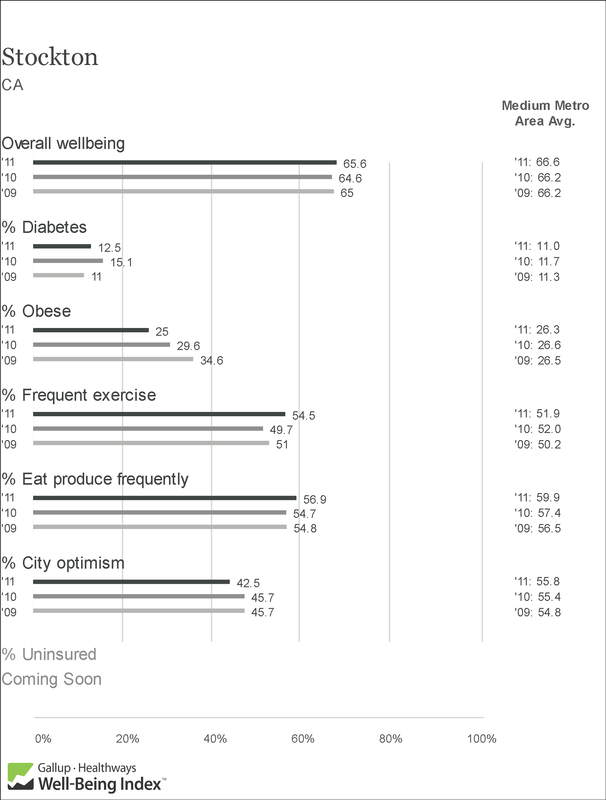 Relying on a number of data sets as well as surveys, the Gallup Well-Being Index is a handy tool that summarizes a handful of key well-being indicators. Here is how Stockton stacks up. As you can see, Stockton resident’s overall well-being is about the average for all cities in the US and has actually gotten slightly better since 2009. So, contrary to what Forbes would like you to believe, people in Stockton do NOT appear to be miserable, according to Gallup’s methodology (I don’t know about you, but I hold the information from a reputable polling and research firm in MUCH higher esteem than the “research” done by an entity whose sole purpose is to sell magazines about money). Stockton is seeing some positive trends here that should be highlighted. For example, obesity rates have fallen substantially since 2009 to now below the national average. Concurrently, the percentage of Stocktonians exercising regularly has risen above most cities. Probably most concerning is the city optimism rate, which, understandably, has dipped in the last year (and was never really close to the national average in the last three years). In fact, Stockton has the 13th lowest rate of city optimism among the cities analyzed, just below Detroit and right above other hard-luck cities as Flint, Las Vegas and Scranton. What does all of this tell us? It shows Stocktonians are not really worse off than most other places when looking at things that actually effect well-being. But despite being fairly middle of the pack when it comes to well-being, Stocktonians still have a fairly negative view of the city. Maybe seeing these not-so-miserable statistics will help us see Stockton in a little better light.